You can have creamy mashed potatoes without completely overdoing the fat. Our recipe uses the delicious Yukon Gold potatoes along with cauliflower and low-fat sour cream to deliver perfect texture and incredible flavor to everyone's favorite potato side dish. No one will ever know you swapped some of the potatoes for cauliflower! A dash of Parmesan cheese adds an umami richness to the dish while fresh chives make for a beautiful presentation. Combine potatoes, cauliflower, garlic, salt, pepper, and water in the pressure cooker pot. Drain cauliflower and potatoes and return to pot; add sour cream, Parmesan cheese, and butter. Mash with a potato masher to desired consistency. Mix 1 tablespoon chives into the mashed potatoes; transfer to a serving bowl and garnish with remaining chives. Cauliflower is a cruciferous vegetable that has recently been touted as a "superfood" because of its healthy attributes. The white color is like a blank slate in recipes like this, and allows it to be incorporated seamlessly! Per Serving: 127 calories; 4g fat; 20.6g carbohydrates; 4g protein; 9mg cholesterol; 276mg sodium. YES! This could not be better. No one knew they weren't normal fattening mashed potatoes! 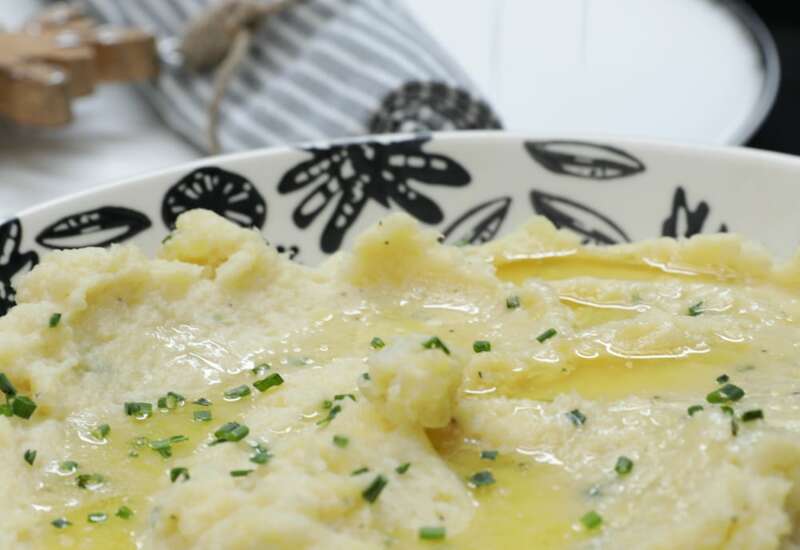 This is the best mashed cauliflower and potato recipe! What I love most is how perfect the texture and consistency are. The sour cream gives it great flavor as well, and the low-fat option is lighter with fewer calories. I made this dish the other day with some beef and vegetables, and the kids absolutely loved it. This is definitely a winner! I am cauliflower crazy, so of course I had to make this dish. No one would guess that these are made with a secret, healthy ingredient! I love the garlicky favors, it was so delicious. Homemade mashed potatoes are the best, and this healthier version is my absolute new favorite. I used russet potatoes with the cauliflower and got the same, delicious results. This was super easy, creamy, and delicious! Easily my favorite mashed potatoes recipe! Yes, it still has cream, butter, and cheese, but it's significantly reduced and the cauliflower provides low carb, low fat nutrition. What's really a plus, though, is how quickly it's made in a pressure cooker! Love it! I wouldn't change a thing. This is so creamy and healthy. My daughters don’t like cauliflower but they love mash potatoes. When I did this recipe last week my family love it, they couldn’t taste the cauliflower at all.